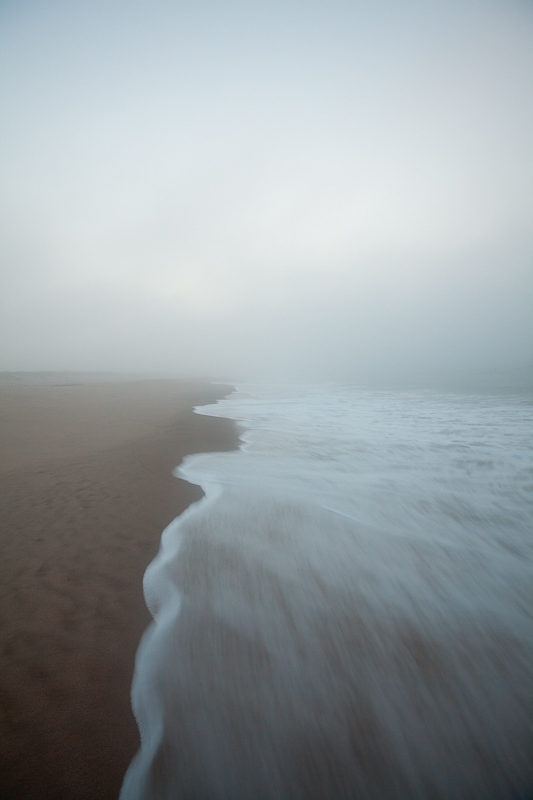 This entry was posted in Photo of the Week and tagged Beach, Cary Wolinsky, Close to Home, Coast, Contemplative, jim fitts, Learning, Miksang, Ocean, Paul Caponigro, Portfolio, Portfolio Review, sand, South Shore Art Center, SSCA by nixonphoto. Bookmark the permalink. I’d say it is an interesting one too. What’s amazing about it is the fact that the far away perspective looks static as if the water is not moving while the closer one is blurred with movement. Sort of like a living body of some creature that would move one side and leave the other static. How about a push in the saturation just little bit? Thanks TJ – I was thinking it looked a bit flat too. I’ll probably bump up the contrast a bit and see what that does. May increase saturation as a side effect. I have been looking at your image for about 10 minutes now, mostly playing with different crops. Have you ever though of a square crop? I see you have put the horizon right in the middle but since it is not a very defined line as the fog envelopes it, I was wondering what the image would look with less sky. I really like the image a lot, as it is definitely quite different from the rest of the work that you have posted. it has a very different feel, more abstract, definitely more fine art to me. I am not sure what images you are going to show at your review but I am suspecting that the theme will be soft water/rocks…in other words, your usual fantastic work! I think you need to put this in the mix and see if it flows with the rest. I recently had my portfolio reviewed in NYC by 5 reviewers at PDN. They were mostly gallery owners, editors, dealers…I knew I was playing out of my league but I was so curious to hear what the experts would say of my work, to get some sort of baseline going. I am usually not afraid of rejection so I knew I had nothing to loose. It was definitely a wonderful experience. the funny thing was that the images they liked the most were those I felt the least for, those I took 5 seconds before leaving a location, that later did not even make the “final cut” in my mind and in Lightroom, but that I added to the portfolio to create “volume” (ouch). Somehow what they all had in common was a certain spontaneous, “out of the box” approach to them…. This threw me for a loop as I started questioning my entire picture taking process, objective and sensitivity. A common comment made by all 5 reviewers was : “I can see that you can take very nice pictures…now it is time to throw “nice” away and push the limits of your creativity and imagination! go past the beautiful image go outside the box!”. So are they saying that I should keep the rejects and throw away the keepers??? :-) I am still struggling a lot with that entire concept. I am curious to hear your reaction after your portfolio. Obviously the type of reviewers make a difference too. Interesting – I hadn’t considered alternate crops. Something to play with for sure. I feel like this will go with the Monhegan rock. There are a few others in a similar vein that could work too. I’ll post the final collection when I have them and figure out how to add a gallery. can’t wait to see the collection!